Bluetooth headphones have come a long way in the last decade. In the mid-2000s, Bluetooth headphones were primarily used as a travel accessory by businessmen and professionals for making and receiving calls. Now, these headphones have become a widespread accessory that is available to everyone. The trend of wired mono headphones is slowly fading away with the rise of these portable and convenient wireless Bluetooth stereo headphones. These Bluetooth headphones provide you with a comfortable and hassle-free experience of listening to music and making calls, even when you are on the move. However, as technology has progressed, it has become increasingly difficult to choose the right headphones. In-ear headphones: In-ear headphones can be inserted into the ear canal (or sit just outside it). These in-ear Bluetooth headphones are extremely portable since they are much smaller in size when compared to on-ear headphones and over-ear headphones and fit in However, these in-ear headphones are not as comfortable as the other type of Bluetooth headphones. 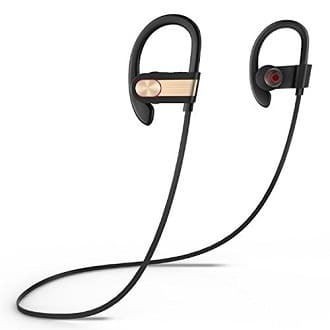 This type of Bluetooth headphones is most suitable for training and outdoor activities because they provide a hassle-free experience even when you are moving or running. Over-ear headphones: Over-ear headphones are sizable headphones that can be worn over the head for a comfortable and immersive experience. While these are not as portable as in-ear or on-ear headphones, they offer a much more comfortable experience to the wearer. Over-ear headphones are generally equipped with advanced features such as hi-fidelity sound and noise cancellation. These headphones are the best choice for gamers and individuals that are looking for comfort and high-quality sound above everything else. On-ear headphones: On-ear headphones are a lightweight and portable version of over-ear headphones that provide you with the right mix between comfort and portability. Unlike over-ear headphones, on-ear headphones do not cover your entire ear since they are not completely closed off. These on-ear headphones let more of the environment and surrounding sounds into the ear than over-ear headphones. Due to their portability and comfort, on-ear headphones are most appropriate for individuals that are looking for the right headphones for sports, running, and travelling. The comfort is an important aspect to consider when you are out looking for a Bluetooth headphone, especially if you are looking forward to wearing the headphones for long periods of time. When it comes to the type of headphones, over-ear headphones are generally the most comfortable choice followed by on-ear headphones with in-ear headphones being the least comfortable. However, there are some other aspects that you need to consider before making a choice as well. In over-ear and on-ear headphones, the shape and type of covering on the speakers determine how comfortable the headphones are. Generally, headphones with round speakers and thick cushioning are more comfortable than others. The size of the headphone is another feature of the headphones that you need to consider. Most over-ear and on-ear headphones are resizable but before buying, you should try them out to check if they are the right fit for you. As for in-ear headphones, the style of the earpieces defines how comfortable the headphones are. There are two styles of in-ear headphones – round and in-canal. Generally, round in-ear headphones are more comfortable to wear than in-canal in-ear headphones but they are also more prone to falling off from the ear. Having said this, in-canal in-ear headphones are also available in a variety of shapes and sizes with cushioned ear-tips helping to keep the headphones in place. When you are looking for the right in-ear headphones for yourself, look for one that is not only comfortable but fits perfectly in your ears as well (to prevent them from falling off easily). If you are looking for a good pair of Bluetooth headphones for traveling or outdoor activities (such as running, walking, or just everyday sports) then portability is another essential factor to consider. In-ear headphones, because of their lightweight and packable design are the most portable of all the types of Bluetooth headphones. These in-ear headphones are a suitable choice because they can be easily worn during outdoor activities (without falling off). When choosing Bluetooth headphones, it is important to consider the weight, size, and foldability to determine how portable it is. A highly portable headphone is one that is not only lightweight but can also be packed into a small and convenient form for easy carriage. Noise cancellation is a factor that mainly depends on what will you be using your Bluetooth headphones for (and where will you be using them). If you are likely to use your headphones in public places where there is a lot of noise or if you want to make important calls with your headphones then the noise cancellation features are something that you need to consider. There are two primary ways in which headphones prevent unwanted noise from causing disturbances: Noise isolation and Noise cancellation. Noise isolating headphones make use of physical means (such as padded earbuds) for keeping away the noise from the surroundings. This type of noise cancellation is known as passive noise cancellation since it does not make use of dedicated circuitry for preventing noise from entering the headphones. On the other hand, noise cancelling headphones make use of multiple microphones (or an outward facing microphone) to detect ambient sound from the surroundings. This interfering sound is then canceled out by the circuitry built into the headphone. This type of noise cancellation is known as active noise cancellation since it can help you tune out all the noise around you besides the music that is playing. The battery life of your Bluetooth headphones depends on what you will be using it for. If you are looking to use these headphones at home then the battery life does not matter much. However, if you are looking to use the headphones outdoors or during travel then you need to look for a Bluetooth headphone that offers good battery life. The general rule of thumb is that the larger the headphone, the better its battery life will be (since larger headphones sport bigger batteries). Most wireless Bluetooth headphones are convenient and helpful as long as they are charged. However, once the battery runs out, there is no alternative way to use them. Some headphone manufacturers take care of this by including a 3.5 mm headphone port and cable with the Bluetooth headphone. This wired option on Bluetooth headphones is the perfect solution for when the battery runs out, just plug and play the headphone cable into the port and that is it! One of the most important features of Bluetooth headphones is that they can connect with your smartphone, tablet, or computer system from a distance. While all Bluetooth headphones allow you to connect with your devices remotely, the actual range of connectivity varies from headphone to headphone. Most Bluetooth headphones offer a range of approximately 30 feet before the audio output starts getting distorted. If you are looking to move away from your device while using the Bluetooth headphones then you should check out the range of the headphones in the specification as well. Generally, over-ear headphones offer a higher range than other types of Bluetooth headphones because they make use of larger antennas. The rule for the range is simple – the larger the antenna, the higher the range of the headphones. These in-ear headphones by TaoTronics are arguably one of the best headphones available in the market today. 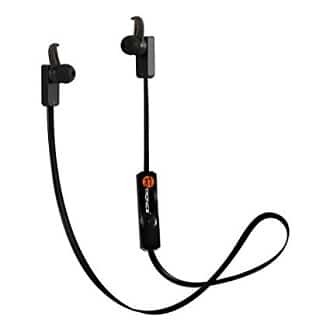 The TaoTronics Bluetooth Headphones feature an intuitive design with detachable ear hooks that makes them suitable for workouts, biking, and running. While the headphones themselves offer wireless connectivity, the earplugs have a wired connection that further improves the comfort and portability of the in-ear headphones. The convenient and lightweight design combined with features such as long battery life and noise isolation make this the best choice for headphones under the $50 range. The TaoTronics Bluetooth Headphones feature an in-canal design with up to three different sized earbuds and detachable ear hooks. The earbuds and ear hooks can be adjusted to ensure that the headphones have a firm and secure grip on the ears. The inventive design of these headphone makes sure that they are a perfect fit for your ears. The ear hooks keep the headphones firmly in place which makes these headphones most suitable for outdoor activities. When it comes to portability, in-ear headphones are the best. These Bluetooth headphones by TaoTronics have a weight of only 0.48 ounces with built-in magnets at the back of each headphone. The magnet allows you to attach the two headphones together when you are not even using them for convenient carriage. Not only this, but you can even wear the headphones around your neck to make sure that they do not get lost in your backpack or pockets. The CVC noise isolation technology that is used on the TaoTronics Bluetooth Headphones prevent unwanted noise from entering the headphones. This makes sure that there are no disturbances caused by environmental noise when you are listening to music or making a call. While the noise isolation technology helps prevent external noise from entering the headphone, there is no active noise cancellation feature included in the headphones. This means that these Bluetooth headphones are not completely soundproof and may have a difficult time coping up with loud noises from the surroundings. 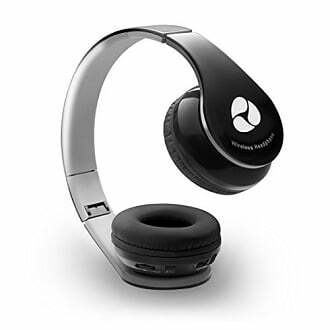 The TaoTronics Bluetooth Headphones are rated to have a battery life of 5 hours of continuous music playback and up to 175 hours of standby time. If you are looking for Bluetooth Headphones that will give you enough juice for the entire day then these headphones are perfect for you. The only drawback here is that there is no wired connectivity on offer which means that if the battery runs out, that is just about it for the day. One of the best features of these Bluetooth headphones by TaoTronics is the high range. In the best case (without interference from surrounding devices), these headphones can give you an incredible range of up to 35 yards i.e. 105 feet! However, this is an optimum result and the range reduces significantly when you use them outdoors. Despite this though, the average range of these Bluetooth headphones is approximately 60 feet which is sufficient for everyday use. Comfortable to wear with a firm grip. Highly portable – the headphones can be conveniently worn around the neck when not in use. Long battery life with up to 5 hours of music playback. Good range of up to 105 feet in ideal conditions (makes them suitable for use at home and outdoors). No support for wired connectivity (which is useful when the battery runs out). The Turbine T2S by Bluedio are premium over-ear headphones that offer amazing sound quality and comfort for an incredible price. The 2.24-inch ear cups on these headphones cover your entire ears and keep you away from all the undesired noise in the surroundings. The music output is of high quality with a strong bass and clear highs. Overall, these wireless Bluetooth headphones are suitable for anyone that is looking to put sound quality and comfort above everything else. The comfort of the Bluedio Turbine T2S headphones is what sets it apart from all the rest. The ear cup and headband are covered with a foam padding to provide a comfortable cushion for your ears and head. The adjustable headband allows you to alter the size of the headphones so that it fits perfectly over your head. The ergonomic design of the Turbine T2S ensures that you can wear it for long hours without feeling tired or fatigued. We know that over-ear headphones can be difficult to carry around because of their larger size and greater weight but that is not exactly the case with these Turbine T2S headphones. Bluedio has added a rotary motor to the headphones to allow the ear cups to be bent at an angle of up to 195 degrees. This means that you can easily pack the headphones into a small and convenient size for easy carriage. While this makes the Bluedio Turbine T2S headphones much more portable than most other over-ear headphones, it is still far behind the portability and convenience that in-ear headphones provide. There is no dedicated noise cancellation feature in the Bluedio Turbine T2S headphones. This means that they are not the best choice of headphones for noisy environments. However, the over-ear design of these headphones does a reasonably good job of keeping surrounding noises away. Sadly though, this does not help when you need to make a call or when the surroundings are very loud. The Bluedio Turbine T2S features a sizable lithium-ion battery that can give you an impressive standby time of approximately 1625 hours (67 days)! The battery is rated to have enough juice for about 40 hours of music playback and 45 hours of talk time. Not only has this, but the headphones even have a wired connectivity option that allows you to connect them to your device via an aux cable. If you are looking for the perfect headphones for your next flight or tour then you should consider the Turbine T2S headphones as an option. Featuring the latest Bluetooth 4.1 technology, the Bluedio Turbine T2S manages to perform considerably well in this department. The Bluetooth headphones manage to produce a signal strong enough to last over 30 feet without causing any hiccups or stutters in the music playback. This makes them convenient for when you wish to listen to music with your smartphone or tablet resting in a centralized location in the room. Superb battery life with a music playback time of 40 hours. Wired connectivity available for when the battery runs out. No dedicated noise cancellation features. Tend to leak noise to surroundings – not suitable for use in an office setting. The Hurricane Turbine H is another masterclass from Bluedio that features a high-quality sound system with powerful bass resonance. These on-ear Bluetooth headphones provide a comfortable cushion padding on the ear cups and headband to ensure that you can wear them for long periods of time without feeling tired or numb. The powerful sound system combined with features such as long battery life, Bluetooth 4.1 support and a built-in music sharing function make these Bluedio Hurricane Turbine H headphones the leading choice for most individuals. Bluedio headphones are known for the high levels of comfort that they offer and the Hurricane Turbine H headphones are no exception to this. With a thick foam on the ear cups and a fine foam lining on the headband, these headphones are extremely comfortable for wear which makes them suitable for long use. The adjustable headbands allow you to calibrate the size of the headband so that it is the right fit for your head. The Bluedio Hurricane Turbine H headphones have a weight of 7.7 ounces (approximately 0.5 pounds) and lack the essential foldable feature that is found in most on-ear headphones. What this means is that it can be quite difficult to carry around these bulky headphones in your hands at all times. If you are looking for Bluetooth headphones that are highly portable and convenient to carry around then you will need to look for other options. There are no dedicated noise cancellation features included in the Bluedio Hurricane Turbine H. However, they have an Acoustic Echo Suppression feature that reduces the effects of acoustic echoes on the voice signal which ultimately improves the voice quality over call. Despite this though, the lack of noise cancellation features eventually means that the headphones are inadequate for use in loud environments. These headphones by Bluedio include 2 rechargeable lithium-ion batteries that can give you enough power for up to 1625 hours (67 days) of standby time! 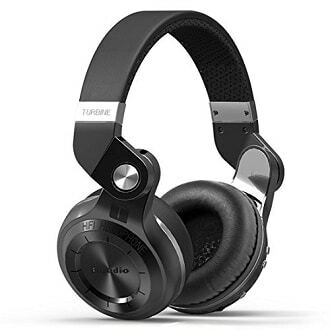 With a music playback time of 40 hours, a talk time of 45 hours, and an option for wired connectivity, the Bluedio Hurricane Turbine H headphones perform magnificently in this department. The Bluetooth 4.1 technology used on the Bluedio Hurricane Turbine H headphones have a signal strength that is strong enough to last over 10 meters (approximately 30 feet). This makes them suitable for use at the gym or at home – you can place your smartphone or tablet in a central location in the room and listen to music while exercising. Very comfortable to wear – suitable for long use. Remarkable battery time with an option for wired connectivity included. The Acoustic Echo Suppression feature ensures high call quality. Bulky design that lacks an option for folding the headphones – much less portable than its competition. The range is fairly average and tends to be inconsistent. The Treblab XR100 headphones a touch of innovation and style to the traditional in-ear headphone design. With ear hooks and an added support on the back of the earbuds, these wireless Bluetooth headphones have been designed to be a secure and comfortable fit for the ears. If you are looking for headphones that have the portability of in-ear headphones and the comfort of over-ear headphones then the Treblab XR100 headphones are the perfect choice for you. The Treblab XR100 headphones feature an intuitive design for ensuring that the headphones fit in your ears perfectly. The ear hooks and added support on the earbuds keep the headphones firmly in place to prevent them from slipping off when you move. Treblab has also thrown in a variety of earbud pairs (of different sizes) with these headphones so that you can choose a pair that best fits in your ears. The Treblab XR100 headphones are sweat-proof which makes them resistant to damage from moisture or sweat. This makes the headphones suitable for biking, running, and exercising. Nothing is better than in-ear headphones when it comes to portability and the Treblab XR100 is no exception to this. Weighing only a mere 0.3 ounces, the XR100 headphones are easy to carry around in your pockets. The Treblab XR100 headphones also come with a stylish round carrying case that you can use to carry around the headphones when they are not in use. These wireless Bluetooth headphones feature the CMC 6.0 passive noise cancellation (or noise isolation) technology that prevents unwanted noise from entering the headphones. The headphones manage to perform very well in loud environments which makes them a fitting choice for outdoor use. The battery on the Treblab XR100 Bluetooth headphones is rated to have a battery life of 9 hours of continuous music playback. The battery can be charged to full capacity in two hours only. However, there is no option for wired connectivity option available for when the battery runs out. 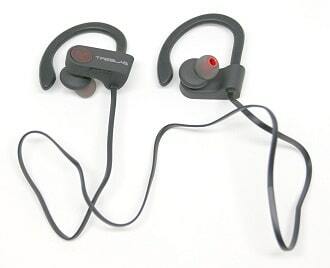 The battery time for these headphones makes them most suitable for sports and fitness activity. The Treblab XR100 headphones make use of Bluetooth 4.1 technology with APT-X compression for music playback. The signal generated by these headphones has a range of approximately 38 feet when your smartphone or tablet is in direct line of sight. However, the signal (and hence the music output) starts to distort after you move 20 feet away from your device. This is a bit disappointing especially when you consider the impressive range that most other Bluetooth headphones have on offer. Good battery life with up to 9 hours of music playback. Comfortable to wear with a sweat-proof design and adjustable earbuds. The CMC 6.0 noise cancellation technology does an incredible job in keeping out noise from the headphones. No option for wired connectivity. These foldable on-ear headphones by Beyution are an economical choice that offers all the essential features that you need in wireless headphones. The Beyution V4.1 Bluetooth Headphones features a built-in microphone with noise isolation technology for ensuring that environmental noise does not disturb music playback. The foldable design combined with the cushioned ear cups and an adjustable headband make these headphones a fitting choice for anyone that is looking for quality within a budget. The Beyution Bluetooth headphones cover all the basics when it comes to comfort with on-ear headphones. The ear-cups and the top of the headband are covered with a thick layer of foam to provide sufficient cushion for the head and ears. The headband is also adjustable which means that you can easily alter its position for finding the right fit for your head. 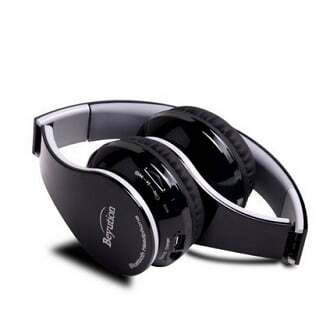 Overall, the Beyution headphones are extremely comfortable to wear that makes them suitable for continuous hours of use. The Beyution wireless on-ear headphones feature a foldable design that makes it convenient to pack and carry the headphones. They also come with a handy pouch that allows for easy carriage of these on-ear headphones. On the downside though, these Bluetooth headphones are a bit on the heavy side, even for on-ear headphones. With a bulky weight of 12 ounces, these headphones can be a nuisance to carry around in the hands. These Bluetooth headphones by Beyution features the noise isolation (or passive noise cancellation) technology that improves the quality of music playback and calls. The headphones perform reasonably well in this department which makes them suitable for use noisy surroundings. The Beyution Bluetooth headphones feature a built-in rechargeable lithium-polymer battery that is rated to give up to 9 hours of music playing time and talk time. Considering the fact that this is an on-ear headphone, the battery time is not impressive (since there is room for a larger battery to be installed). There is also an option available for wired connection with the use of an aux cable but that is not suitable for when you are outdoors or exercising. However, if you are looking forward to casual use at home or office then these headphones might be the right choice for you. These wireless headphones are based on the Bluetooth 4.1 technology with a signal strength that can last up to 25-30 feet without distortion. The range of these headphones is sufficient for everyday use but if you are looking forward to outdoor activity on a regular basis then you should consider other options. Thick layer of foam ensures that these headphones are extremely comfortable. Noise isolation technology that prevents unwanted noise from seeping in. Foldable design that makes these headphones more portable than most other on-ear headphones. An economical choice for Bluetooth headphones. Poor battery life (only 9 hours of music playback time). The range is below par. Heavy and bulky – can be difficult to carry around for long periods of time. The Photive HF1 Bluetooth on-ear headphones feature a lightweight design with an immersive sound system that delivers a well-balanced and consistent experience of music playback. The highlight of these headphones is the dedicated control panel that is conveniently placed on the left ear cup. This control panel features an Aux In port, a USB charging port, a LED indicator, and controls for music playback and volume. The Photive HF1 wireless Bluetooth headphones are best suited for individuals that are looking for comfortable and stylish headphones for everyday use. The Photive HF1 Bluetooth headphones take an innovative turn away from traditional on-ear headphones. Instead of foam, the earpads and headband are covered with a soft leather skin that has been specifically designed for comfort. The leather skin prevents painful pressure points from developing over long periods of time. This means that you can use the headphones for hours without irritation and discomfort. The lightweight and durable components that have been used on the Photive HF1 Bluetooth headphones ensure that they are not only comfortable but highly portable as well. The weight of these headphones is an astonishing 5 ounces (0.3 pounds) only. This makes sure that the headphones are very easy to carry around everywhere. However, the downside here is that the headphones do not sport a foldable design which means that you will need a bag-pack or pouch for carriage. The Photive HF1 are equipped with a noise isolation feature that prevents surrounding noise from entering the headphones. The headphones perform quite well in loud environments and offer a rich, immersive music playback experience to the wearer. These Bluetooth headphones feature a rechargeable lithium-ion battery that is rated to last an impressive 12 hours of music playback. Photive claims that the battery on the HF1 can last an entire day of casual use and indeed it can. There is also the handy option for wired connectivity available for when the battery is about to run out. Enjoy endless music playback with these incredible headphones by Photive. The Photive HF1 headphones make use of the latest Bluetooth 4.1 technology for wireless connectivity. The signal produced by these headphones is strong and can last up to 33 feet without distorting. The range is not as impressive as some of the premium offerings in this range but it is suitable for indoor use (such as at the home or office). Exceptionally comfortable to wear – the soft leather skin padding makes sure that you can wear these headphones for hours without causing irritation. Good battery time with an option for wired connectivity. Highly portable because of the incredibly light weight of 5 ounces. The range is below average. No foldable design for enhanced portability. The APIE Bluetooth in-ear headphones feature an attractive design with the controls for music playback integrated into the earphone itself. The headphones are equipped with ear hooks and a safety-oriented ear-tip design that makes it suitable for workouts and outdoor exercise. The headphones themselves are most suitable for outdoor activity because of their fashionable and soundproof design. These in-ear headphone by APIE incorporates the traditional ear-hook design which ensures that the headphones fit perfectly on the ears. The headphones themselves are covered by a thick plastic covering that provides a comfortable experience to the wearer. The headphones have also been designed to be water-resistant and sweat-proof that makes them suitable for use during exercise or training. 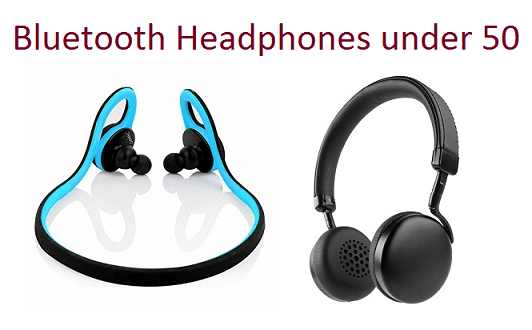 However, keep in mind are no additional earbuds provided with these Bluetooth headphones which means that you will have to buy them separately if the ones that are provided do not fit into your ears. Ultrahigh portability is a characteristic that is commonly associated with in-ear headphones and the APIE wireless Bluetooth headphones abide by this rule as well. The lightweight design of these headphones ensures that they can be easily carried around anywhere, anytime. There is no dedicated noise isolation or noise cancellation technology featured on the APIE wireless Bluetooth headphones which is disappointing, to say the least. If you are looking to stay in a quiet and calm environment then these headphones are a good choice but if you are expecting even a bit of noise in the surroundings, you should look towards other choices. The rechargeable lithium-ion battery in the APIE wireless Bluetooth headphones has a standby time of approximately 185 hours (7 days) and a music playback time of about 5 hours which is impressive for in-ear headphones. 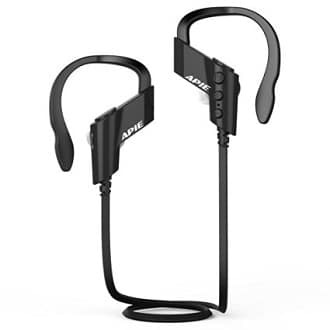 If you are looking for headphones that you can wear during exercise or outdoor training then these APIE wireless headphones are a reasonable and economical choice. The APIE wireless sports headphones feature the Bluetooth 4.1 technology that is capable of producing a strong signal so that you can enjoy music playback within a 10 meter (30 feet) radius. This makes it convenient for the indoors such as gyms, homes, and offices. Good battery life with a standby time of up to 7 days. Very easy to pack and carry. 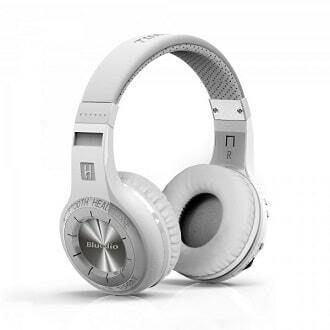 No dedicated noise cancellation – performs poorly in noisy conditions. The AELECT Flexbuds are top of the line wireless headphones that feature an ergonomic design for providing superior levels of comfort. The EDR APT-X audio decoding technology used on these headphones make sure that the output sound quality is crisp and clear so that you can enjoy the music at its best. The high-quality sound system combined with a lightweight and sweat-proof design make this one of the most competitive headphones in this review list. The AELECT Flexbuds is arguably one of the most comfortable in-ear headphones available in the market today. The rotatable earbuds on these headphones are flawlessly integrated with ear hooks and memory foam lined ear tips to provide an immensely comfortable experience to the wearer. Memory foam is an enhanced version of polyurethane foam that provides optimum levels of comfort to the wearer. If comfort is your priority with headphones then nothing gets better than the AELECT Flexbuds. As with most in-ear headphones, the AELECT Flexbuds are incredibly lightweight and highly portable. With a weight of only 0.3 ounces and a flexible silicone-insulated wire, you can easily pack these headphones to take along with you anywhere you like. These headphones make use of the CVC 6.0 digital noise cancelling technology to prevent outside noises from causing disturbances. This is the only headphone in our list of top headphones that features active noise cancellation. Enjoy music in its highest quality with the AELECT Flexbud headphones. The lithium-ion battery on these AELECT Flexbuds is rated to have a music playback time of up to 4 hours and a talk time of up to 6 hours. The headphones also sport fast charging capability which means that you can charge the battery to full capacity in only an hour. However, there is no option for wired connectivity which means that you will have to keep an eye on the battery levels at all times. These wireless headphones are equipped with the Bluetooth 4.0 technology with an operation range of approximately 30 feet. While this is the specified range for these headphones, the signal produced by the AELECT Flexbuds is actually quite strong and it can even withstand penetration through walls without much distortion. Immensely comfortable to wear with a sweat-proof design. Active noise cancellation that enables high-quality calls and music playback. Lightweight design with flexible silicone wiring that makes these headphones highly portable. The battery time is below par. Comfort, style, and functionality – if this is what you are looking in your Bluetooth headphones then the Fleeken On-ear Wireless Headphones are a formidable choice. Featuring soft leather earpads with a powerful stereo sound system and long battery life, these Bluetooth headphones are appropriate for both the indoors and the outdoors. 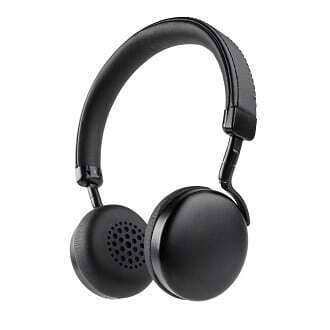 The Fleeken Headphones feature an ergonomic design that makes the handsets comfortable for long term use. The ear pads and headband are layered with a soft leather skin that ensures extra comfort for the wearer. The adjustable headband also makes it convenient to calibrate the size of the headphones for a perfect fit. These Bluetooth headphones by Fleeken features a foldable design that can be easily packed through an angle of 90-degrees. The ear cups and headband have been made to be extra flexible so that they can be easily packed into a compact size for easy carriage. However, the 10.4-ounce weight of the Fleeken Bluetooth headphones makes them inconvenient and difficult to carry around everywhere. In order to cut down the price of the headphones, Sponal has opted not to add a noise cancellation feature to its Fleeken Bluetooth headphones. The on-ear design manages to eliminate some noise from the surroundings but it does not perform well in loud environments. The battery that is included with the Fleeken Bluetooth headphones is a lithium-ion variant that is rated to have a standby time of up to 100 hours. The music playback time for these wireless headphones is 10 hours while the talk time is 8 hours. Though the battery time is not as high as one would ideally like it to be (for on-ear headphones), it is still impressive for the price. There is also an option for wired connectivity available for when the battery runs out of juice. The wireless range for the Fleeken Bluetooth headphones is the standard range of 10 meters i.e. 30 feet which is characteristic of most Bluetooth 4.0 devices today. This makes the headphones suitable for studying, working, and traveling. Foldable design that allows the headphones to be packed into a compact size. Impressive battery life for the price with an option for wired connectivity included. With a weight of 10.4 ounces, the headphones are a bit on the heavy side. No noise cancellation feature included. The Honstek H9 are in-ear headphones that have been designed for exercise and outdoor activity. The silicone ear hooks on the headphone ensure that they stay firmly in place even when you are moving or running. The advanced APTX tech sound system combined with noise reduction and voice prompts make this a fitting choice for individuals that want to enjoy their music playback while they are exercising or working out. The Honstek H9 headphones feature an ergonomic and user-friendly design that incorporates silicone ear hooks with cushioned earbuds for providing optimal levels of comfort. A soft silicone gel lining on the headphones also make them water-resistant and sweat-proof that is ideal for running, exercising, and hiking. For the earbuds, there are two different sizes available so that you can choose the one that fits you best. Like most other in-ear headphones, the Honstek H9 headphones are highly portable with a weight of only 1.6 ounces. These in-ear headphones can be easily packed into a hand-held pouch for convenience in carriage. The Honstek H9 headphones feature the CVC 6.0 noise reduction technology that filters out unwanted noise from the surroundings to provide you with high-quality sound output. The noise cancellation is passive which means that you can use the headphones in the loudest of surroundings without having to worry about disturbances. These wireless headphones by Honstek are fitted with an 80 mAh lithium-ion battery that is rated to have a standby time of 240 hours (10 days) and a music playback time of 7 hours. This is an impressive battery time when compared to other in-ear headphones particularly because they all operate on a single battery. However, as with all other in-ear headphones, there is no option for wired connectivity for when the battery runs low. The Honstek H9 wireless headphones feature the Bluetooth 4.1 technology with a signal frequency of 20 – 22 kHz. The signal strength for these headphones can last up to 30 feet in all directions from a centralized location. This makes the headphones suitable for use at home or at the gym. CVC 6.0 noise cancellation that keeps away noise from the surroundings. Highly portable and incredibly comfortable to wear. The range is fairly average. Bluetooth headphones offer you the convenience of listening to music and making calls without having to keep your smartphone or tablet nearby. The wireless connectivity comes quite in handy for exercising, training, and outdoor activities in general. At the same time, if you hate the mess that wired headphones make, Bluetooth headphones are the right choice for you. There are three general categories of Bluetooth headphones: In-ear, On-ear, and Over-ear. In this guide, we cover all the aspects that you need to look for when buying a budget Bluetooth headphone such as the comfort, portability, noise cancellation features, battery life, and range.